Pompeo Meets With Turkey's Leaders Amid Diplomatic Crisis Over Missing Journalist The U.S. secretary of state is in Ankara, where the Turkish government alleges journalist Jamal Khashoggi was murdered by Saudi agents, a charge Riyadh denies. U.S. Secretary of State Mike Pompeo shakes hands with Turkish Foreign Minister Mevlut Cavusoglu before their official talks in Ankara, Turkey, on Wednesday. U.S. Secretary of State Mike Pompeo met with Turkish leaders Wednesday amid the diplomatic crisis over the disappearance of Saudi journalist Jamal Khashoggi, and says President Recep Tayyip Erdogan "made clear that the Saudis had cooperated" with Turkey's investigation. Khashoggi, a critic of Saudi policy who has written for The Washington Post and other publications, has not been seen since he entered the Saudi Consulate in Istanbul on Oct. 2. The Turkish government alleges he was murdered, a charge the Saudis have vehemently denied. Turkish officials reportedly hope on Wednesday to enter the Saudi consul's residence as part of their probe into the journalist's disappearance. Pompeo was dispatched by President Trump on Monday to meet with leaders in both countries. Trump has recently give the Saudis the benefit of the doubt in Khashoggi's disappearance, after taking a harder stance last week. "Here we go again with you know you're guilty until proven innocent," Trump told The Associated Press on Tuesday. On Wednesday, Trump spoke about the close business and strategic relationship between Saudi Arabia and the U.S. "They're an important ally, but I want to find out what happened, where is the fault, and we will probably know that by the end of the week," he told reporters. Trump said the U.S. has requested access to any audio or video evidence from Turkey's investigation "if it exists. ... I'm not sure yet that it exists, probably does, possibly does." Saudi Arabia has launched its own investigation, and Pompeo said Wednesday: "When the investigation comes out, we'll evaluate it. It's not about benefit of the doubt, it's reasonable to give them a handful of days more to complete it, so they get it right." 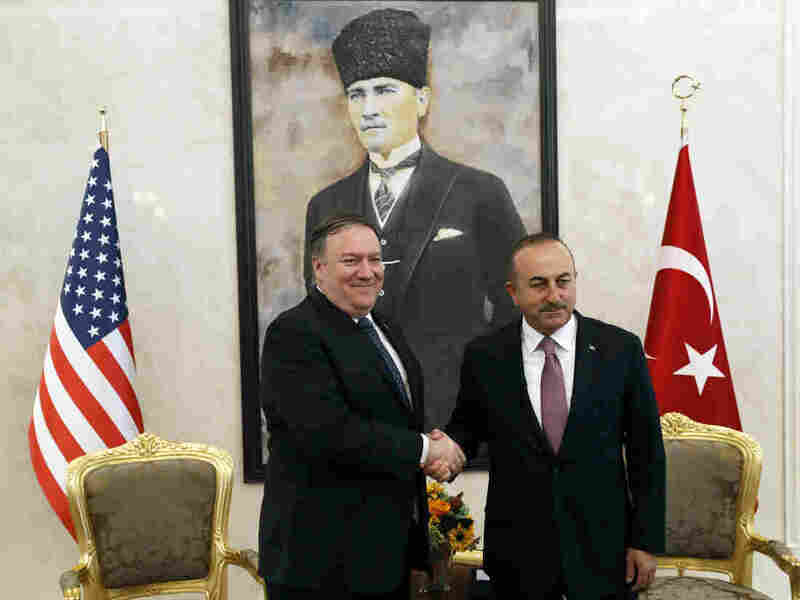 Pompeo met with Erdogan as well as Turkish Foreign Minister Mevlut Cavusoglu in the city of Ankara, talks that the Turks described as "beneficial and fruitful." Reuters reports that Cavusoglu has said Pompeo would bring information about Khashoggi's disappearance to Ankara. Earlier this week, Pompeo met with Saudi officials and released a statement saying, "I emphasized the importance of conducting a thorough, transparent, and timely investigation, and the Saudi leadership pledged to deliver precisely on that." The president concluded: 'Answers will be forthcoming shortly.' "
A pro-government Turkish newspaper has reported that that an "assassination squad" of 15 Saudi men who police say flew into Istanbul hours before Khashoggi was last seen entering the Saudi consulate. The New York Times reported on Tuesday that one of the suspects identified by the newspaper was a frequent companion of Saudi Crown Prince Mohammed bin Salman. The man is also reportedly linked to the prince's security detail. The Times says nine of the 15 men with alleged links to Khashoggi's disappearance worked for the Saudi security services, military or government ministries. Pompeo said that he and Erdogan also spoke about Pastor Andrew Brunson, whom Turkey recently released from custody after about two years. The U.S. had imposed sanctions on Turkey over Brunson's detention. "The fact that Pastor Brunson has now made his way back to the United States, I think, opens up lots of opportunities," the secretary of state said. Pompeo said he would have a decision "shortly" on whether certain sanctions on Turkey would be lifted, and that he first needed to discuss it with Trump. "Some of the sanctions that were put in place were directly connected to Pastor Brunson and there's a logic to now removing those," he said.